Is Your New MacBook Air's Wi-Fi Crappy? A couple of thousand disenfranchised Apple customers seem to have descended on the Apple Support Forums, all with problems with their shiny new MacBook Airs. The problems they’re seeing sound eerily similar to those we’re experiencing with our machines: Wi-Fi will initially connect, but after a minute or two the connection will stop working, and a total reboot is needed to be able to connect again. The problem is made worse when the Air is on a desk, quite possibly something to do with the Wi-Fi antenna being (*we think*) in the black plastic strip along the bottom of the screen. An anonymous source at one of Apple’s retail stores in London has also told me they’ve had “well above average” complaints and returns (in a few cases) of Airs owing to Wi-Fi issues. While it’s impossible to be sure of the accuracy of that, if true, it’s indicative of a pretty major problem. Given that people are having these problems with every creed and colour of Wi-Fi router (and that we’ve been seeing the same problem on a bunch of different Wi-Fi networks) it certainly seems like there’s a problem with the new Air’s Wi-Fi system. 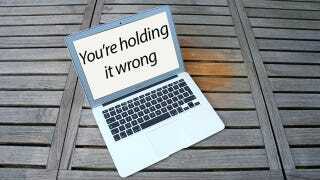 Whether it’s just a software bug, hardware problem or idiot users holding it wrong remains to be seen, however. Are you having trouble?